Today we are at The Pokémon Company.1 I would like to “ask” about Pokémon Black Version and Pokémon White Version, which are just about to be released. Producer Ishihara-san is here, as well as Masuda-san and Sugimori-san from Game Freak2, the main developers of the game. Thank you for coming. 1The Pokémon Company: In addition to brand management of everything related to Pokémon, including video games and the card game, the company operates six Pokémon Centers around Japan. Founded in the year 2000. 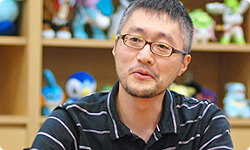 2GAME FREAK, Inc.: The video game developer responsible for the Pokémon series and other titles. Founded in 1989. First, I would like to ask how you began talking about making a second completely new pair of Pokémon games for the Nintendo DS. I suppose I should ask the director about this. Yes. I had always wanted to make a second generation of games for the Nintendo DS. Because the Nintendo DS has spread around the world to such an amazing degree. There are more than 100 million out there. Exactly. If possible, I wanted everyone to own at least one, and began development with that huge ambition. Just like the last pair of games, Pokémon Black Version and Pokémon White Version will be coming out for the Nintendo DS, but your basic stance when you began this time was quite different than it was for Pokémon Diamond Version and Pokémon Pearl Version 3, wasn’t it? 3: First released for the Nintendo DS system in Japan on September 28, 2006. Yes. Since this generation would be presented on the same system, I was extremely worried that it would turn out to be basically the same as its predecessor. If we tried to make it the same way as normal, I thought the games would turn out to be similar to Pokémon Diamond and Pokémon Pearl. Because you’re so used to making them. Right. So we started by changing our basic approach. You began with the question of how you could—for lack of a better way of putting it—break down everyone’s image of what Pokémon games should be like on the Nintendo DS. Yes. Working on the series for so long, our mindset had become fixed. Trading Pokémon by going to a Pokémon Center had become a matter of course. We first needed to break down those fixed conceptions. You decided to use this opportunity to rethink certain things that had built up over the long history of the Pokémon games, such as how you make them and the rules that govern them. I thought some people would find kanji easier to read. So after Pokémon Diamond Version and Pokémon Pearl Version came out and everyone at Game Freak was making Pokémon Platinum Version 4, you were examining the games from a number of different angles and thinking about how you could make them so that players never “graduated” from them. 4: First released in Japan for the Nintendo DS system in September 13, 2008 as the new version of and . Yes, I thought about it for roughly two years. But when we were making Diamond and Pearl, we didn’t have to think too hard in order to establish a difference with previous games, because we had the Nintendo DS as new hardware. 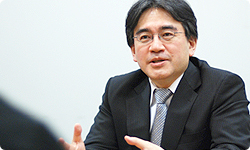 Simply making the games for the Nintendo DS created a distinction. Compared to the Game Boy Advance, the wireless functionality had improved dramatically, Wi-Fi connectivity had been added and it could be operated by touch. 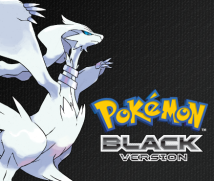 But if we had approached Pokémon Black Version and Pokémon White Version with the same attitude as the previous games, they would have turned out the same, so this time a new mentality was absolutely crucial. I see. As the producer, Ishihara-san, it was your role to listen to Masuda-san’s ideas about what he wanted to do before anyone else. 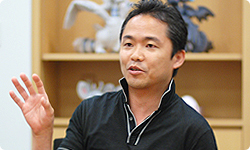 In general, producers tend to adopt the view that if something is being received well, you shouldn’t mess with it too much, so when Masuda-san told you he wanted to fundamentally rethink the Pokémon games, was your happiness at his desire to make big changes mingled with nervous excitement? My happiness was overwhelmingly the stronger of the two. The Pokémon games began with Pokémon Red and Pokémon Green (Red and Blue in Europe) 5 (Red and Blue in Europe) for the Game Boy, and then Pokémon Gold and Pokémon Silver 6 came out for Game Boy Color. 5 and : The first generation of games in the Pokémon series. First released in Japan for the Game Boy system on February 27, 1996. 6 and : The second generation of games in the Pokémon series. The games were compatible with the Game Boy Color system, so Pokémon appeared in various colours. First released in Japan on November 21, 1999. Game Boy Advance had Pokémon Ruby and Pokémon Sapphire 7, and the Nintendo DS has Pokémon Diamond Version and Pokémon Pearl Version. 7 and : The third generation of games in the Pokémon series. First released in Japan for the Game Boy Advance system on November 21, 2002. It has been the series’ destiny to transfer to a completely new platform every time a completely new generation came out. The Nintendo DS, however, has had a long lifespan and spread around the world. We were able to make a second generation for the Nintendo DS by, from the point of view of development, making effective use of already-existing resources. You sensed that you could use your know-how developing for the Nintendo DS—your “resources” cultivated in development of Pokémon Diamond and Pokémon Pearl, in making Pokémon Black Version and Pokémon White Version. The changes were so big that even a grizzled veteran such as yourself wondered if it were possible? 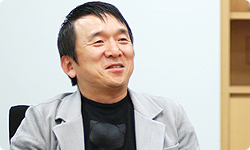 Sugimori-san, what was your first impression when you heard what Masuda-san wanted to do? Masuda gives us a sort of policy speech each time outlining what he wants to do. Yes. And usually a lot of it is fairly eyebrow-raising. But this time all the Pokémon are new, so I bet you were especially surprised. I get the feeling Masahiro Sakurai-san8 doesn’t budge either. 8Masahiro Sakurai: Director of games in the Kirby and Super Smash Bros. series. He is currently developing Kid Icarus: Uprising for the upcoming Nintendo 3DS system. He shows us something and says, “This is what we’re going to make,” and everyone thinks, “What? We’re going to make that? !” You think he’ll change his mind later on, but he never does. He runs with it all the way to the end. I think the staff had quite a hard time of it this time.